I’m a bit undecided about pockets, now. 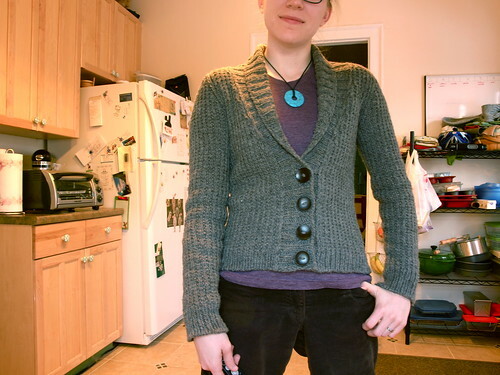 I had originally planned on patch pockets, but I really like the look and fit of the cardigan without them. I think that because I have such a relatively short torso, pockets would end up just looking bulky given where they’d hit; had I planned to knit a cardigan that hit at the lowest part of my hip, I could see pockets working well (for me – I don’t mind “emphasizing” my hips since they’re on the narrow side), but I think I don’t really want to put pockets right on my tummy. Either way, I’ll still including directions for them in the pattern/tutorial, since the whole idea is that the cardigan is customizable in length and overall fit. I’m also considering elbow patches, just because I adore the idea of elbow patches, especially on a sweater like this one, and I do put some serious wear-and-tear on the elbows of my sweaters. I’m unsure what material to use, though, and my sewing skills are pretty rudimentary. I know I’d need to figure out a way to get a nice clean edge, so I’m trying to think of things that wouldn’t unravel when cut – a thin wool felt? fleece? I’m definitely open to input, here! I’m not considering this project an FO just yet – there’s still a pattern/tutorial to finish, and a few more decisions to make on the finishing. But I’m happy to be able to wear it! It’s exactly what I wanted – a basic, versatile, polished but still cozy cardigan that I can wear with the vast majority of the outfits I teach in. Perfect! looks great on you. love the color, and oh, that collar! perfect. What a fantastic looking sweater! Great work. I seriously want one for myself. I think felt would work nicely, especially as far as having clean edges, and being durable. I bet using blanket stitch to attach them would also help preserve the edges. That’s an adorable cardigan, congratulations! :D The buttons are a perfect choice with that fabric. It looks great on you and quite nice without the pockets. Also, I love the collar. That looks terrific! And I think the decision to leave out pockets was probably wise. I’ve seen a lot of new patterns with pockets in the front and kangaroo pockets, and while they look handy and comfortable, I think they would also emphasize areas of my middle that don’t need the extra attention! It’s adorable! I really didn’t follow how it was going to look at the end through the process, so I’m a little surprised by the shawl collar, but I think it’s great. The buttons fit it so well, too. I absolutely love this sweater. I’ve been coveting something similar for a long time, but can’t find the perfect pattern. Your ability to sit and design exactly what you want is truly inspiring. If you could find 100% wool felt to make the elbow patches that would be nice. The edges of the felt won’t ravel and using a blanket stitch to hold them in place would add just the right rustic note to the sweater. Of course if you were feeling really ambitious you could take some of the leftover yarn and create felted/fulled patches! I just know you have tons of extra time to do such a project. ;) I love the look without the pockets. You design such beautiful sweaters. Stay warm in the upcoming winter storm that is forecast for the weekend. I love it! It looks absolutely perfect on you–just like it was made for you. I like the thought of wool felt patches for the elbows, but you could always take a look at a classic–suede patches. They have look-alike fabric for that that doesn’t ravel. I love this sweater! It fits you like a glove (or like a well-fitting sweater, if you will – I mean, why should gloves get all the credit? ), and I’m a big fan of the shawl collar. Well played! Perfect! I can’t wait to see more details. I have to make this sweater! Please say there is a pattern? Not that you have time to make one now…I will be patient.